Seven tropospheric species (CO, HCN, C2H6, C2H2, CH3OH, HCOOH, and H2CO) released by biomass burning events transported to the high Arctic were monitored with two sets of FTIR measurements, located at Eureka (Nunavut, Canada) and Thule (Greenland), from 2008 to 2012. We compared these data sets with the MOZART-4 chemical transport model to help improve its simulations in the Arctic. Emission factors of these biomass burning products were derived and compared to the literature. We use modeled estimates of BVOCs from the years 1000 to 2000 to test the effect of anthropogenic BVOC emission changes on SOA formation, aerosol size distributions, and radiative effects using the GEOS-Chem-TOMAS model. 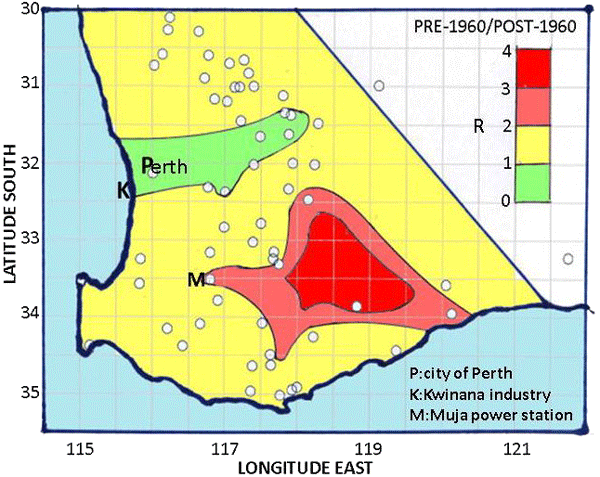 Changes of >25% in the number of particles with diameters >80nm are predicted regionally due to extensive land-use changes, leading to increases in combined radiative effect of >0.5 Wm-2. This change in radiative forcing could be an overlooked anthropogenic effect on climate. We show that atmospheric load of ice nuclei is enhanced for up to 20 days after key rainfall events. The rate of enhancement decreases exponentially with time. Rainfall quantity and frequency are increased for a similar duration and with similar exponential decreases thereby supporting the notion of rainfall feedback. We reveal series of significant feedback in rainfall patterns across Australia over the past century and marked changes in feedback patterns, and we indicate their locations. We measured the oxidative potential of airborne particles – a property that has been linked to health problems caused by particles – from different emission source mixtures in Fresno, CA. Copper was responsible for the majority of the oxidative potential (as measured by the DTT assay), followed by unknown species (likely organics) and manganese. Sources of copper-rich particles, including vehicles, had higher oxidative potentials. Using a series of model simulations, we find that at widespread NH extratropical locations, interannual tropospheric ozone variability is largely determined by the transport of ozone from the stratosphere. This has implications in the interpretation of measured tropospheric ozone variability in light of changes in the emissions of ozone precursors and in the response of tropospheric ozone to climate change. Ambient concentrations of trace elements with 2h time resolution were measured in three size ranges (PM10–2.5, PM2.5–1.0, PM1.0–0.3) at kerbside, urban background and rural sites in London during the ClearfLo (Clean Air for London) field campaign. Quantification of kerb and urban increments, and assessment of diurnal and weekly variability provided insight into sources governing urban air quality and the effects of urban micro-environments on human exposure. The study presents a characterization of the vertical, spatial and seasonal variability of Arctic clouds and mixed-phase clouds (MPCs) over the entire Arctic region. MPC properties in the region of the Svalbard archipelago (78°N, 15°E) are also investigated. The occurrence frequency of clouds and MPCs are determined from CALIPSO/CLOUDSAT measurements processed with the DARDAR retrieval algorithm which allows for a reliable cloud thermodynamic phase classification. Ozone measurements onboard three Concordiasi balloons flown in the stratosphere in the Antarctic spring of 2010 are presented. These measurements are the first long-duration in situ measurements of Antarctic springtime stratospheric ozone. By matching air parcels, ozone loss rates where derived. Downwind of the Antarctic Peninsula, very large ozone losses of up to 230 ppb per day or 16 ppbv per sunlit hour were observed. These high rates are consistent with almost complete chlorine activation. High aerosol loads over Alborán were mainly associated with desert dust transport and occasional advection from central European urban-industrial areas. The fine particle load observed over Alborán was surprisingly similar to that obtained over the other three nearest AERONET stations, suggesting homogeneous spatial distribution of fine particle loads over the four studied sites in spite of the large differences in local sources. This study developed a theoretical framework to analyse the contribution of absorption to scintillation, which can be used to derive the imaginary part of the ARISP in the urban atmospheric boundary layer from scintillation measurements. In this study, a simple expression for the imaginary part of the ARISP is obtained, which can be conveniently used to determine the imaginary part of the ARISP from LAS measurements. The experimental results showed good agreement with the presented theory. Ensembles of results from multiple models require systematic screening according to well-defined and analytical principles described in the paper. The screening guarantees more robust conclusions especially in the case of scenario analysis. In the Arctic clouds are very important for determining the melting of the sea ice. The radiative properties of the optically thin Arctic clouds strongly depend on the number of particles available for water uptake. This study argues that the Köhler equation commonly used for simulating cloud droplet activation is not fully complete for describing the condensational growth of the interaction of the hydrophilic and hydrophobic entities on the structures of the airborne polymer gels present. A metric measures the difference between two system states. So far, there is arbitrariness in its definition in terms of wind, temperature and surface pressure of the atmosphere. The choice of definition affects many applications: e.g. predictability studies, error growth analyses and ensemble forecasts. We construct a new metric based on vector space theory and energy conservation, and apply it to analytic models and atmospheric data. We discuss its advantages over a widely used older metric. Atmospheric CH4 increased from 900ppb to 1800ppb during the period 1900–2010 at a rate unprecedented in any observational records. We use bottom-up emissions and a chemistry-transport model to simulate CH4. The optimized global total CH4 emission, estimated from the model–observation differences, increased at fastest rate during 1940–1990. Using δ13C of CH4 measurements we attribute this emission increase to biomass burning. Total CH4 lifetime is shortened by 4% over the simulation period. We investigate the atmospheric chemistry that occurs in the plume of Mt. Etna shortly after emission. We measured O3 destruction in the plume. Using simultaneous measurements of SO2 and wind speed, we approximate the rate of this destruction. BrO, expected to be an indicator of ozone-destructive chemistry, is also detected. A computer model is able to approximately reproduce these results and is used to make inferences about the chemistry occurring that cannot be directly observed. Particulate matter (PM) at ground level is of primary concern for the quality of the air we breathe. Most direct sources of PM are near the ground, but an important fraction of PM is produced by photochemical processes happening also in the upper atmospheric layers. We investigated the contribution of those layers to the PM near the ground and found a significant impact. Nitrate is a major player in the “vertical direction”, owing to its sensitivity to ambient temperature and relative humidity. In an effort to characterize the effect of shipping on Arctic air quality during the 2013 shipping season, air-quality monitoring stations were installed in Cape Dorset and Resolute, Nunavut, Canada, to measure NOx, SO2, PM2.5, O3, and BC. Results indicate that on the order of 5--25% of local cumulative exposure to these pollutants is due to ship emissions. This approach is complementary to pollution measurements at the source and has wider applications for the impact of traffic on air quality. Sources and propagation characteristics of high-frequency gravity waves observed in the mesosphere using airglow emissions from Gadanki and Hyderabad, India, are investigated using reverse ray tracing. Wave amplitudes are also traced back, including both radiative and diffusive damping. Interestingly, large vertical shears in the horizontal wind are noticed near the ray terminal points (at 10-12km altitude) and are thus identified to be the source for generating the observed gravity waves. Model-simulated air quality trends over the past 2 decades largely agree with those derived from observations. In the relative amounts of VOC and NOx emission controls in different regions across the northern hemisphere have led to significantly different trends in tropospheric O3. Differences in the historical changes in the relative amounts of NH3, NOx and SO2 emissions also impact the trends in inorganic particulate matter amounts and composition in China, the U.S. and Europe. We show that the ion balance and molar ratio methods are unsuitable for use as aerosol pH proxies. Our recommendation is that 1) thermodynamic equilibrium models constrained by both gas and aerosol inputs run in the forward (open) mode, and 2) the phase partitioning of ammonia provides the best predictions of aerosol pH. Given the significance of acidity for numerous chemical processes in the atmosphere, the implications of this study are important and far reaching. We present for the first time the relative effect of climate, emissions, and land use change on ozone and PM25 over the United States, focusing on the national parks. Air quality in 2050 will likely be dominated by emission patterns, but climate and land use changes alone can lead to a substantial increase in air pollution over most of the US, with important implications for O3 air quality, visibility and ecosystem health degradation in the national parks. Residential wood combustion contributes significantly to the total atmospheric particulate burden; however, uncertainties remain in the magnitude and characteristics of wood burning products. The effects of wood loading on freshly emitted and aged emissions were investigated. Polycyclic aromatic hydrocarbons, which negatively impact health, contributed more to the total organic aerosol under highly loaded burner conditions, which has significant implications for burner operation protocols. 1. High CO abundances of 300-550 ppbv is shown in aircraft MOZAIC data between 700 and 300 hPa over East Asia in three episodes. Correspondingly, elevated CO is observed in satellite MOPITT data at similar altitudes. 2. GEOS-Chem and FLEXPART simulations reveal distinct uplifting processes for CO from fires and anthropogenic sources in the cases. 3. Topography in East Asia affects uplifting of CO in different ways. 4. The new version 5 MOPITT data can help diagnose vertical transport of CO.
Measurements and upgrades of the rotational Raman lidar of the University of Hohenheim during the HD(CP)2 Observational Prototype Experiment are presented in this paper. This includes 25h long time series of temperature gradients and water vapor mixing ratio. Through simulation, optimum wavelengths for high- and low-background cases were identified and tested successfully. Low-elevation measurements were performed to measure temperature gradients at altitudes around 100m above ground level.